There is not just one you, there are many yous. We're part of a multiplicity of universes in parallel dimensions � and Everett Singh's dad has found a way in. But he's been kidnapped, and now it is as though Everett's dad never existed. Yet there is one clue for his son to follow, a mysterious app: the Infundibulum. The app is a map, not just to the Ten Known Worlds, but to the entire multiverse � and there are those who want to get their hands on it very badly. 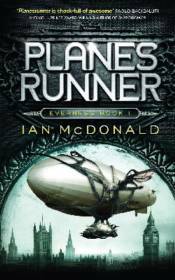 If Everett's going to keep it safe and rescue his dad, he's going to need friends: like Captain Anastasia Sixmith, her adopted daughter and the crew of the airship Everness.